Seventy years after the UN Charter was supposed to prohibit wars of aggression, we can see that the only countries that have complied with the spirit of the charter have been the so-called communist block, now non-communist Russia and nominally communist China. Unlike the Soviet government in 1951, which was inexplicably absent from the Security Council to veto the UN mandate for the US invasion of Korea, Russian President Vladimir Putin and his government have rejected any Security Council resolution rubber-stamping of the US war in Syria. That is probably the most remarkable historical aspect of the current situation. This has led to an all-out propaganda campaign to classify Russia as an aggressor although it is merely exercising the same right to collective self-defence that has privileged seventy years of US wars and mercenary actions to impose governments and political-economic regimes on the rest of the world’s population. Now the US regime is “worried” about escalation. With good reason one ought to say. After twenty years of covert and economic warfare against post-Soviet Russia and despite every attempt by the government in Moscow to reach an amicable arrangement with the US and its vassals, Russia has drawn a line. Will the US cross it? Will Russia hold it? 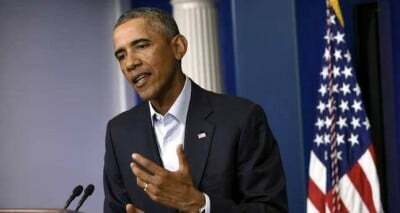 US President Obama has suggested that Russia will get “bogged down” in Syria. What is he saying? Translated into historical context this means the US is contemplating ways in which it can apply Brzezinski’s strategy– after the fact. Putin has admitted the error of intervening in Afghanistan to defend a secular government threatened by a mercenary army combining Afghan latifundists and opium producers armed to the teeth by the US regime. In the 1980s Russia was unable to withstand the US-funded onslaught. But then the war in Afghanistan has not ended either. Perhaps the lesson to be learned there is different. In the 1830s, Britain dominated India through the chartered East India Company, the forerunner of the modern multinational corporation, complete with control over taxation, land, its own army and the opium trade. Between 1839 and 1842 the British, in fact the East India Company with a combined force of British and Indian soldiers waged a war to control this mountainous territory between the Russian Empire and British India. At enormous cost military victory was attained but Britain did not succeed in establishing control over Afghanistan. In 1878, the British again tried to subdue Afghanistan and integrate it into its Indian Empire. Again Britain had to concede internal government to Afghan rulers and was only able to impose suzerainty– in the form of British control of Afghanistan’s foreign relations. Britain was gain defeated in Afghanistan in a brief war in 1919. The only accomplishment was to fix the boundaries between Afghanistan and British India, the so-called Durand Line, which became the border between Afghanistan and the Muslim state, Pakistan, which emerged from Britain’s duplicitous efforts to prevent emergence of a united secular India. Today the successors to the East India Company’s massive opium monopoly are still at work pacifying Afghanistan and maintaining control (together with the US regime), having turned Helmand province for example into one of the largest opium producing regions in the world. In the 19th century Britain considered Russia its number one threat to India– threat to the massive bureaucratic plunder of a country with a population of over 200 million by some 200,000 from a European island with about 20 million inhabitants. (This was certainly comparable to Leopold II’s proprietary relationship to the Congo– both economically as well as demographically.) Ostensibly for this purpose Britain invaded Afghanistan three times. However, despite this alleged threat, Russia first intervened in Afghanistan in 1979 to defend the secular government the US regime was doing its best to overthrow. Its withdrawal in 1989 has to be seen in the context of the vicious war of attrition the US was waging and the overall economic crisis that led to the collapse of the Soviet Union and the COMECON/ Warsaw Pact. As the British should know military victories in Afghanistan were never cheap and territorial control was never assured. However, the profitability of the global opium/ heroin trade has always been guaranteed by combinations of regular and corporate armies (like the East India Company and the CIA). This remains far more important than the Great Game– which then as now was a diplomatic fraud perpetrated to sustain parliamentary support for wars of private enrichment. Today Mr Obama alludes to Brzezinski’s fanatical strategy for taxing the ordinary populations of the world in money and lives to maintain the same model of “free enterprise” inherited from Britain. It is a scarcely veiled threat to use whatever means are necessary to make it as impossible to defend Syrian sovereignty as it was for Russia to defend Afghanistan. Telling Russia they could get “bogged down” in Syria means nothing else but that plans are being considered for intensifying the terrorist war in Syria and anywhere else the US has assets that could drain Russia. When the Russian foreign minister announced that the US refused to identify any contacts that could be made with a so-called “moderate” opposition, it became clear that the US cannot name them because they do not exist– any more than they did in Iraq or Libya. Distracting the public with talks about cooperation and adamant declarations that Putin must abandon Assad before the US Empire can approve Russian participation is clearly a tactic for buying time until a Plan B can be implemented. Russian air strikes will kill civilians. All air strikes do. It is mendacious– not merely hypocritical– for a regime whose troops have wantonly starved, massacred and irradiated Iraqis for over 15 years to pretend that civilian lives are at issue. President Obama, like his predecessors, know that there is virtually no difference between a smart 500 lb. bomb and a dumb one– except if one actually has a military target. Historically the US has never refrained from bombing indiscriminately, ask any Korean north of the 38th parallel or any Vietnamese born before 1975. We will only know if Russia’s campaign against US-sponsored terrorism in Syria saves civilian lives when and if the smoke is cleared and the Damascus government is allowed to function for its citizens as it had before the US and Israel began waging war against it. Until that time, it is ludicrous to debate how many people may die in Russian airstrikes—especially there is no willingness to stop Saudi airstrikes in Yemen or Israeli airstrikes wherever they feel like it. Moreover the Russian government is stating the obvious—which eludes US vassals in Europe—when they insist that Syrians have a right to safe and secure homes in Syria. Until the US and its lackeys stop destroying them there will be no end to refugees. Why are all these public statements and propaganda campaigns from the US regime and its global media operations important– if at least thinking folks know that they lie? It remains central to US global strategy that the white population in the US and Europe stay on its side at all costs. Non-whites have known– no later than when Patrice Lumumba was murdered in 1960– that their lives do not matter, that the UN has never protected them. Were ordinary “whites”, meaning those who just by chance were born in Europe or North America, were to recognize that these wars of enrichment, “regime change”, and humanitarian intervention are part of the process that has been impoverishing them– albeit at a slower rate– since 1971, they just might– and that is an enormous “if” stop worrying about refugees or so-called Christian civilisation and ask why they allow a psychopathic 1% of the population to plunder the world– at their expense too. They might see that every bomb or automatic rifle built in Germany, France, or Britain is a job lost, a teacher or doctor too few, or food and rent too high—or a pension unpaid. But that is a big “if” for those eyes fixed to smart phones and talkshows. Vladimir Putin told the 70th General Assembly of the United Nations something the world has in fact forgotten. No better said, he called attention to the great lie of 1945. The United Nations was not founded in San Francisco in June 1945. It was actually founded in Yalta in February 1945. Churchill, Roosevelt, and Stalin agreed the framework by which the peace would be organized. One of those features was the settlement of reparations for the war the West had waged against the Soviet Union. When the San Francisco conference was convened, the US version of the “new world order” was already drawn. Later Churchill publicly lied about the Yalta agreement when he told Truman’s constituents in Fulton, Missouri that territory and resources he had also agreed should be under Soviet control had been seized by an “Iron Curtain”. The lies did not stop there. The atomic bombs dropped in Japan in August of 1945 had been sent as a message to the Soviet Union that what Hitler could not do with ground forces, the US would do with air forces. By 1947, the US had already made its secret rearmament plans to bully and bankrupt Soviet reconstruction efforts. NATO was organised (1949) before the US re-invaded Korea (1951) as a “defence” against the Soviet Union– while the CIA was organising terror cells throughout Europe as so-called “stay behinds” and buying or manipulating elections together with Italian and French organised crime syndicates to assure pro-US governments. The US response to Stalin’s proposed demilitarisation of Germany was to create the Federal Republic, forcing the Soviet Union to organise the Democratic Republic several months later. Despite all attempts to provoke the Soviet Union, the Warsaw Pact was not established until after US air attacks (1955) on the Soviet territory during the US invasion of Korea. It is worth noting that the Soviet Union had withdrawn all forces from Korea after the war ended, while the US military deposed the Korean People’s Government and reinstalled the Japanese colonial gendarmerie which subsequently, together with the US military government, began a vicious death squad campaign against peasants and nationalists who were opposed to US occupation. In short the UN began in Yalta in February 1945 and was gerrymandered by the US regime by June of the same year. From that time onward the US regime has manipulated the organisation as a fig leaf for its “open door” empire, filling it with the best diplomats and international bureaucrats money could buy. Thirty years ago I was accredited to the UN headquarters as a freelance journalist. There was still a Soviet Union, a GDR, Yugoslavia, and Libya. Four countries vilified by the West until they were dismantled, dismembered or destroyed. Four states that in the entire history of the UN never waged a war on foreign soil, four states that with all the weaknesses that states throughout history have had managed to secure modest but comprehensively sound quality of life for their citizens in the sense of those conventions utterly ignored in the West, e.g. the International Covenant on Economic, Social and Cultural Rights (1966). I heard Ronald Reagan blaspheme in the plenary of the General Assembly, attacking poor countries struggling to fulfil that covenant like Nicaragua and Cuba. I also heard David Lange tell the General Assembly that France was guilty of state terrorism because of its bombing of Greenpeace’s Rainbow Warrior that year– for interfering in France’s atomic testing– in Auckland harbour. France got the EU to boycott New Zealand for that bit of honesty. Ronald Reagan tried, like his fan Barack Obama, to accuse the Soviet Union/ Russia of global interventions. What he failed to say, as Obama also omitted, was that all the places that Soviet troops had been sent were countries where the US regime was waging covert– usually mercenary wars– against an established government. However this is the way all US official statements must be read: the accusation is an admission of its own actions. It is probably safe to say that the US will never accuse another country of doing something it is not doing itself. We all know this from school: a pupil caught cheating or assaulting another pupil yells loud—“look who is cheating” or “look who is fighting” and points his finger at the person he has just hit or from whom he has copied the work. It is that simple. There is no secret agenda; no mysterious meeting whose minutes must be leaked before we know the truth. We all went to school or grew up with those kinds of children and saw them protected by teachers and their parents.